A couple of years ago, Kevin Klinkenberg, who currently heads the Savannah Development and Renewal Authority, authored an excellent book about the myriad benefits of a day-to-day lifestyle that relies on walking: Why I Walk: Taking a Step in the Right Direction. I read an advance copy of the book and joined a variety of other commentators in writing blurbs endorsing Kevin’s book. Savannah itself is an important player in Why I Walk, but the thrust of the text is more universal. The principles and examples could be applied in some way by people who live across America and around the world. I should note that, before he became SDRA director, Kevin also wrote a wildly popular Savannah Unplugged post that later appeared as an op-ed in the Savannah Morning News: Savannah as a model for the nation: not 1733, but today. I write this because it seems that sometimes we forget just how important walking is to the current and future health of our city. Kevin doesn’t delve into specific examples, but it’s interesting that this piece has been published as the city of Savannah is about to conduct a misguided “experiment” that will make Bay Street less walkable. For the month of September, we’re going to remove over 100 on-street parking spaces on the south side of Bay Street — spaces that generate millions of dollars for nearby businesses annually — so that travel lanes can be widened in the hope that sideswipe auto collisions can be reduced. In the process, we’ll have speeding traffic just a few feet from the sidewalk on the south side of Bay Street from MLK to East Broad. Click here for my recent City Talk column detailing all the negative fallout that we’ll see from that experiment. Ironically, this experiment is in part the end result of Mayor Eddie DeLoach’s expression of concerns about traffic traveling too fast on Bay and the unpleasantness of being on the sidewalk near City Hall. With wider lanes and less on-street parking, we’ll have even faster traffic on Bay and even more unpleasant conditions for pedestrians, in addition to the massive damage done to nearby small businesses and property values. Yes, we might reduce sideswipe accidents with wider lanes, but we’ll raise the odds of truly catastrophic crashes. More recently, city officials announced that they might also add a truck ban to Bay Street in the evening until very early morning. That’s worth trying, I think, but I’d invite city officials and members of city council to stand beside Bay Street on a typical weeknight, when traffic really isn’t heavy at all. Some drivers are going far in excess of the speed limit, and a relatively small number of those vehicles are large trucks. With wider lanes, no trucks at all in the evening, and no on-street parking, some of those light vehicle drivers will go even faster. One important point: a couple days ago, John Bennett of the Savannah Bicycle Campaign told the SMN that the September experiment could result in a “false positive” involving vehicle speeds. In other words, since the temporary medians will be marked with a sea of orange traffic barrels, we will see some drivers automatically slow down. If we had permanent medians there, those drivers would not slow down. What a mess. Clearly, the city of Savannah needs more people on staff who can advocate clearly and effectively for pedestrians and for small businesses. Beyond the immediate issue of Bay Street, Kevin’s piece about Savannah’s walking brand is worth keeping in mind for a variety of other reasons. For example, incredibly, there isn’t a signalized crosswalk on either the east or west side of Forsyth Park between Gaston Street and Park Avenue. That’s about 3/8ths of a mile. On MLK south of Gwinnett, we’ve got a median that prevents many pedestrians with limited mobility from crossing the street for blocks at a stretch. I could go on and on with examples. 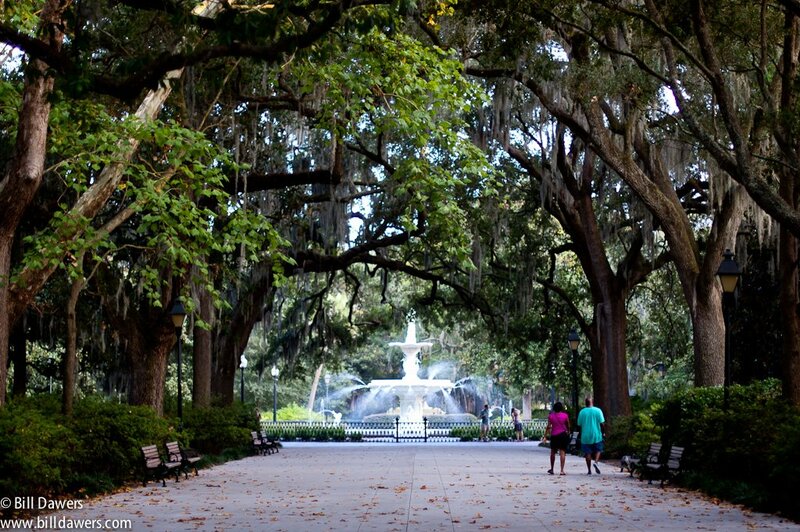 Yes, Savannah’s older neighborhoods are dramatically more walkable than many places in America, and Savannah’s downtown area remains breathtakingly beautiful in many places, but those qualities exist because of good planning in the relatively distant past. We need to make sure that we make decisions right now that reinforce the visionary planning in Savannah’s history.